I saw the tiredness and anguish in the eyes of our “grunts” on the ground and some asked me why they were there. I saw the plight of the refugees who tried to climb in our helicopters or Caribou aircraft when we took off near villages. I saw the Viet Cong owned the night and sometimes the day. I saw the fruitlessness, casualties mounting in what could be called victory. By the summer of 1967, about a half million American military were in Vietnam; about 20,000 US servicemen had been killed and even higher numbers wounded. Further, thousands of South Vietnamese had been killed and wounded, including noncombatants, and many others had been reduced to refugee status. The havoc wreaked was horrendous. But the protests against the war arose not because of the increasing number of casualties but from the sense that Vietnam War was an unnecessary war. It was for many a mistake that irrevocably changed the lives of the young people who served and their families. The lives of the draft-eligible men changed too, even those who managed to obtain deferments by crowding into colleges and universities or who fled to Canada. I had become increasingly concerned about the war, which disproportionately sent young blacks into battle and seemed to have no rationale except extending US imperialism. The antiwar movement on campus had heated up considerably since 1964 with the acceleration of American involvement. Martin Luther King Jr.’s Riverside Church speech, “Beyond Vietnam: A Time to Break Silence,” on April 4, 1967, when he talked about the diversion of funds from fighting poverty to funding the Vietnam War, strengthened my resolve to participate in protests and help bring it to an end. I was a graduate student and antiwar protester at the University of Michigan and realized the only way to truly understand the conflict was to witness it firsthand, and so I went to Vietnam that summer to see the war for myself. I persuaded the campus paper, the Michigan Daily, and enough local newspapers to constitute the 100,000 subscribers I needed for Defense Department press credentials. By this time, protests against the war had increased exponentially and even Secretary of Defense Robert McNamara’s son at Stanford University was an antiwar activist. I saw no news reporters attached to a particular military unit, no “embeds,” when I went throughout South Vietnam from the Mekong Delta to the demilitarized zone (DMZ) on the border with North Vietnam—from Can Tho and Buon me Thuot and Nha Trang to Pleiku, Da Nang, and Dong Ha—tagging along with men in every branch of the service. Wherever I could hitch a ride: in a truck convoy, an airplane, or walking with the troops, I just joined in as we all tried not to get killed. It was not only the danger but also the confusion about why we were there, expressed to me by the troops, that left me upset and further disillusioned. After that summer, I came home further disgusted by our foreign policy, by the harm done to the Vietnamese population, and the exploitation of our own young people—the troops on the ground. I saw the plight of the Vietnamese refugees who literally tried to climb in our helicopters or already crowded Caribou aircraft as we flew away from their villages. I felt the fear of living in regions where the fighting Viet Cong owned the night and sometimes the day. I saw the fruitlessness of our military campaigns, even those dubbed successful. 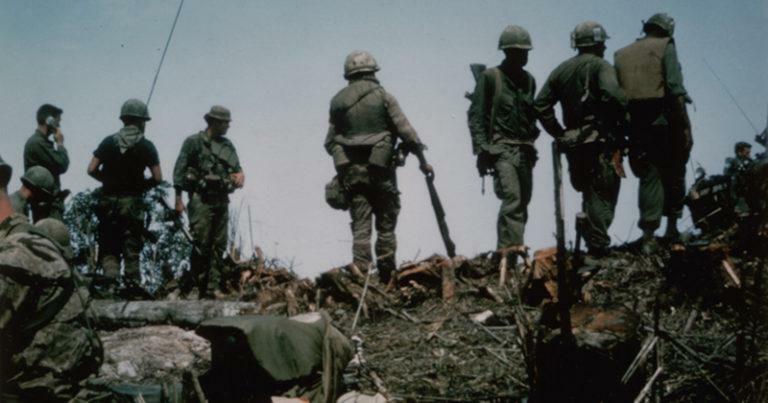 We walked in the hot sun in Operation Cochise in July 1967 as the marines attempted to clear the densely populated area around Da Nang Air Base. The US command reported 156 enemy killed and 13 captured, and only 10 marines killed and 93 wounded. The South Vietnamese reported 83 killed, 174 wounded, and 3 missing. The marines had expected a large operation with a definitive outcome, but it turned into mostly a bush-beating effort—some bloodshed, wounding, and killing with hand-to-hand fighting—which was clearly not a victory. We were not winning the war at Con Thien either, which the Marines, who saw heavy casualties and enemy fire, later called a little piece of hell. Two miles down from the DMZ, the base was a slight hill of red dirt with barbed wire encircling the artillery, trenches, and underground bunkers covered with sandbags. The incoming enemy artillery fire seemed continuous. The Viet Cong kept their guns hidden in caves, brought them out to fire at us, and then hid them again. The marines fired back, and the barrage continued. Down below us at the base of the hill, marine engineers had been working since early 1967 to bulldoze a fence to at least 500 meters wide on the border as part of the so-called McNamara Line, an electronic anti-infiltration barrier to block communist flow of arms and troops into South Vietnam. From our vantage point above, we could see the engineers working with heavy equipment in the heat and suffering higher casualties than the rifle companies on the hill where we stood. They well deserved the steak and potatoes dropped to them in jerry cans, while on the hill we ate C rations. That year, as about 40,000 men were inducted each month, the draft issue increasingly became a focus of the resistance movement. The local, politically controlled draft boards let white, middle-class college-going men gain deferments while the poor and young African American men served. In 1967, 64 percent of eligible black men were drafted and only 31 percent of eligible white men. The black unemployment rate was 7.3 percent, while for whites it was 3 to 4 percent. Blacks were more likely to serve in the infantry and to volunteer for hazardous duty to receive more money and perhaps a promotion. On October 16, 1967, countrywide draft-card burnings and turn-ins led to more than 1,000 draft cards collected at the Justice Department. However, Attorney General Ramsey Clark only prosecuted leaders, including Benjamin Spock and Yale chaplain William Sloane Coffin. By the late 1960s, men accused of draft dodging and those seeking conscientious-objector status dominated federal court dockets. More than 210,000 were accused of draft-related offenses. On October 21, 1967, 150 thousand protesters gathered in Washington, DC, to “Confront the Warmakers.” They marched to the Pentagon while 2,500 federal troops and marshals helped police maintain order. Some 700 protesters were arrested on allegations of violent behavior during the march. These events received nationwide press coverage, heightening awareness of the growing antiwar sentiment, and Vietnam veterans among others began organizing their own groups at the march. 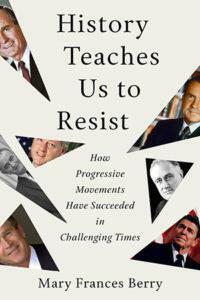 From History Teaches Us to Resist. Used with permission of Beacon Press. Copyright © 2018 by Mary Frances Berry.